Mandira, I hope you enjoyed reading some of my mails published in the previous posts which were written to some of my dear friends. It contained some interesting topics for you. Let’s now move on with another fascinating and intriguing subject like destiny or fate. We have at some point of time in our life wondered if there was any control over the events occurring in our lives. Where do they come from? Why some circumstances take place in our life and not in other’s? What should we do when we are faced with formidable life circumstances and how can one face their onslaught, if they are overwhelming? This post was written by me lying in the bed when I was unwell and recovering from sickness a few weeks ago. I hope it will satisfy some of the commonly asked questions in our minds which we seek and wish to know on our long journey of our life. The last few days have flown at a dizzying speed. Everything was moving in the right direction for me. I was in a very good health, enjoying good and restful sleep, eating and exercising well. This showed on my face which was glowing and radiant. I was full of energy and bounce. My mental and emotional health was sound when one fine day I suddenly crashed and I fell ill. I got a fever and felt enervated. I was laid up in bed for two days and was recuperating. Throughout the resting period, I was in communion with my inner self, talking to my Soul asking questions and receiving replies. Although I was cut off from the outside world, there was a lot of activity going on in my inner world. ‘Life goes on, work goes on, they never stop’ as they say I reflected on it. Life flows continuously like the flowing of the river waters and in our lives activity must go on because work is a form of worship, we worship God in this way too. During my confinement in bed, all these things stated in the following space came in my mind which gave me illumination and a slight peep into the spiritual laws of karmas. I realised that our destiny or prarabdh is fixed because of our past deeds and released energies in the cosmos. Some circumstances will inevitably take place no matter what. Some of these are pleasant and happiness giving while others we wish to ignore or delete them out of our lives. So how does one face the concurring circumstances? What should be our attitude towards the continuous inflow of not so pleasant, unpalatable and not so easy life situations? It dawned on me that working out and living one’s destiny is sadhana and tapasya. Whichever karma comes our way, what so ever life circumstances we have to grapple with, should be accepted gracefully as Prasad of God, as Grace of God, as Kripa. This is wisdom. Therefore, I meditated and contemplated on these enlightening thoughts for two days while recuperating thereby working out my karmas as well as recreating something wonderful and good for future by visualizing, recreating and re-structuring my future. My future depends on today. What I create today, I get tomorrow! It was during this time that I saw a big yantra, a geometrical figure with my inner eye. This is the same yantra which we had seen in the birthplace of Divine Mahavatar Babaji in an obscure village in Tamil Nadu. 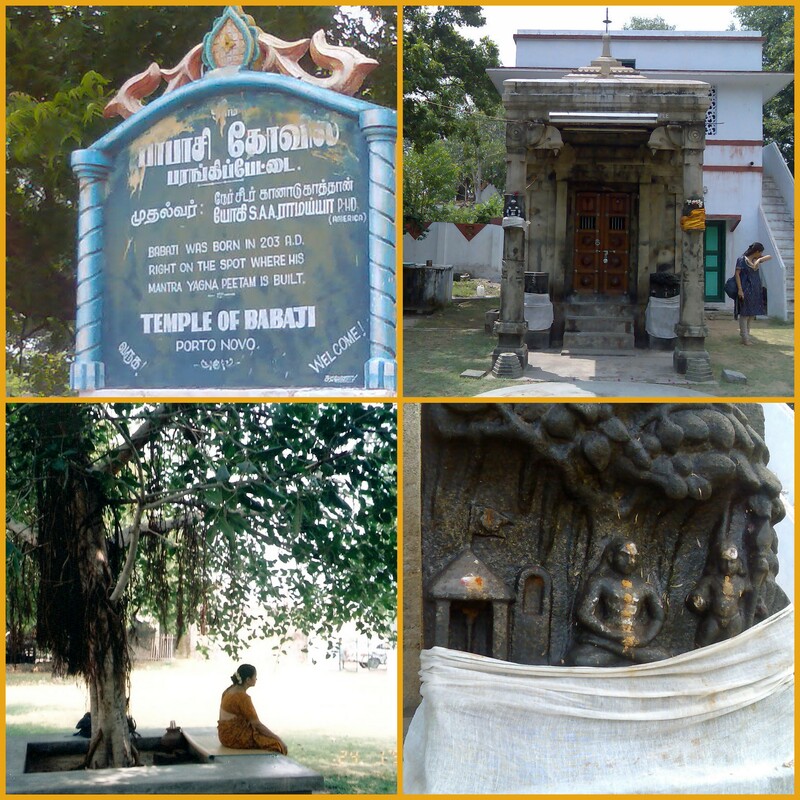 Attached below are a few pictures of Perrangaipettai or Porto Novo as it was earlier called. 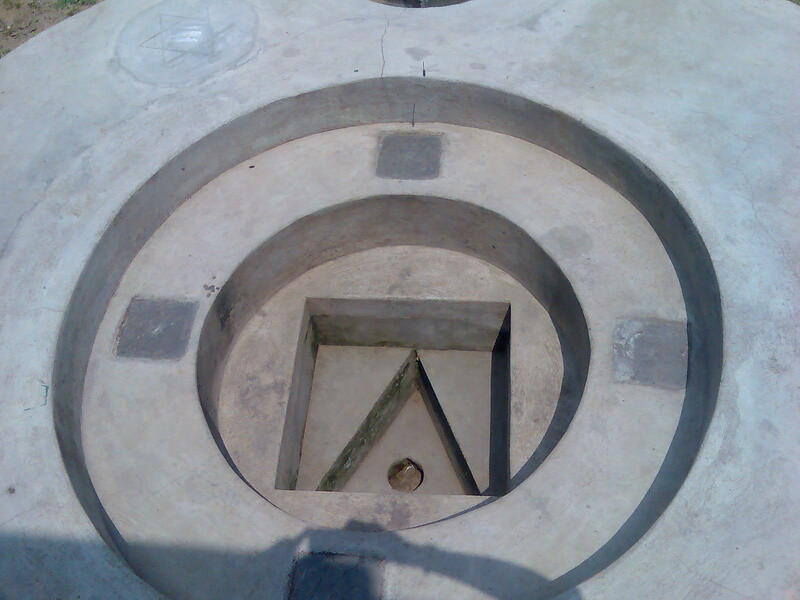 In the centre of this yantra was a circle. Out of this place, I saw a high level of energy, in the form of Light, which began to emit and flow towards me. It soon began to enter my body. I felt energized at that very moment and I could feel the distinctive creative powers entering me. My whole body was completely energized and I felt recharged with subtle divine energies. I was immediately elevated and became very relaxed after this. The tingling creative vibrations entered my every pore thereby not only healing me but also bestowing on me a good amount of creative energy which I very much needed because of my illness. I was pondering over the fact about how will I be able to write my next article and what should I write? To create good literary work, one needs to ask God to grant you, shower on you divine creative powers and energy otherwise the work reflects ‘you’ and not the Highest Force. So no matter how many times during our sadhana, we are met with innumerable hurdles because of inevitable play of our destiny or some other unknown forces in nature, we must not be afraid to face them. Prarabdh karmas are going to manifest till our last day, they must not deter us in our spiritual progress. We must not lose hope and feel disappointed and therefore never get tired of it all. We must endure. We must go on relentlessly as this is the only way for the human being to overpower the powerful force of the effects of the karmas created by him before in the past. Along side, we must think, wish and visualize positive pictures and images in our mind to create a pleasant and dynamic future. Whatever is manifested in the physical world is first created in the mental world. All creations are born in the subtle domain first. In this way, we can recreate a better and brighter future of our choice and liking with the power of our will. This is ‘selection by Will.’ This is how destiny can be re-created consciously. Everything lies in our hands. We create and build our destiny by overcoming past karmas with submission and acceptance and at the same time creating new, better, refined karmas with positive attitude and creative visualization. Om shanti, shanti, shanti Om. This entry was posted on Friday, October 10th, 2008 at 3:19 pm and is filed under Uncategorized. You can follow any responses to this entry through the RSS 2.0 feed. You can leave a response, or trackback from your own site. we cannot escape our prarabdha, we have to reap what we have previously sown but sometimes the impact of our past karmas is too much to bear. though it would be suggested that in such time, we direct our minds to God sometimes situations are so overwhelming that its not possible. what should one do in such a situation? how does one build endurance? Dear Mandira, like all other virtues, endurance too comes with practice or experience! Endurance is built on faith and patience. Rough times come in our life to teach us patience. During unfavourable times look at all the favourable things in your life, look at what is happening now positively because whatever is happening today is just a part of the big design. Enjoy this phase like others. Ma. as much as I can. It does have a calming effect on me. In the heart of my being, Father, I am one with You, and I recognize You as Being, the Father of all. You are Spirit, Omnipresent, Omnipotent, Omniscient. You are Wisdom, Love and Truth, the Power and Substance and Intelligence of which and through which all things are created. You are the Life of my Spirit, the Substance of my Soul, the Intelligence of my thought. I am expressing You in my body and in my affairs. You are the beginning and the end, the very All of the good which I express. The desire of my thought which is implanted in my soul is quickened by Your Life in my Spirit, and in the fullness of time, through the law of faith, it is brought into visibility in my experience. I know that the good I desire already exists in Spirit in invisible form and but awaits the fulfillment of the law to be made visible and I know that already I have. The words which I now speak outline to You, my Father, that which I desire. As a seed it is planted in the soil of my Soul and moved upon by Your quickening Life in my Spirit. It must come forth. I allow only Your Spirit – Wisdom, Love and Truth – to move in my Soul. I desire only that which is good for all and I now ask You, Father, to bring it forth. Father, within me, I ask to express Love, Wisdom, Strength and Eternal Youth. I ask to realize Harmony, Happiness, and Abundant Prosperity, that I may have the understanding direct from You, of the method of bringing forth from the Universal Substance that which will satisfy every good desire. This is not for self, Father, but that I may have the understanding so that I may be of service to all Your Children. That which I desire is already in visible form. I form in mind only that which I desire. As a seed begins its growth underground in the quiet and in the dark, so does my desire now take form in the silent, invisible realm of my soul. I enter my closet and shut the door. Quietly and confidently I now hold my desire in mind as already fulfilled. Father, I now await the perfect outpicturing of my desire. Father, within me, I thank You that now in the invisible the fulfillment of my desire is already established and I know that You have poured out lovingly and lavishly to all an abundance of Your treasure, that You have filled every good desire of my life, that I may partake of Your opulent supply, that I may realize my oneness with You, that all Your children may realize the same; and that whatever I have, I may pour out to help all Your children. All that I have I give to You, Father. All acts and thoughts of mine shall confirm that I have already received in Spirit the fulfillment of my desire and it is now brought forth into perfect visibility. In spirit, in soul, in mind, in body, I am true to my desire. I have perceived my good in Spirit. I have conceived it as a perfect idea in soul and I have given true thought form to my desire. I now bring into visibility, or true manifestation, my perfect desire. I thank You, Father, that I now have Love, Wisdom, and Understanding, Life, Health, Strength, and Eternal Youth, Harmony, Happiness and Abundant Prosperity, and the method of bringing forth from the Universal Substance that which will satisfy every good desire. – We must go on relentlessly as this is the only way for the human being to overpower the powerful force of the effects of the karmas created by him before in the past. Along side, we must think, wish and visualize positive pictures and images in our mind to create a pleasant and dynamic future. Whatever is manifested in the physical world is first created in the mental world. All creations are born in the subtle domain first. – Instead of complaining and accusing others, we must use our energies to become talented and modify our lives and take it to greater heights. -To create good literary work, one needs to ask God to grant you, shower on you divine creative powers and energy otherwise the work reflects ‘you’ and not the Highest Force. -Prarabdh karmas are going to manifest till our last day, they must not deter us in our spiritual progress. -Working out and living one’s destiny is sadhana and tapasya. This is wisdom. -We must think, wish and visualize positive pictures and images in our mind to create a pleasant and dynamic future. Whatever is manifested in the physical world is first created in the mental world. All creations are born in the subtle domain first..
And this para is s beautiful and inspiring. thank you dearest and adorable Maa for sharing this. All creations are born in the subtle domain first – this is so true Maa, because as they say, God first visualised the picture of the world in his mind and then it manifested. No?